As the world’s eyes are focused on the unfolding Rohingya refugee crisis Bangladesh, to the east in India another danger may be brewing for the Rohingya Muslim community. Over the past year since the latest wave of state-backed violence and displacement began in northern Myanmar, almost a million Rohingya refugees have fled to a small, slippery patch of land known as Cox’s Bazar on Bangladesh’s southern edge. Crammed into over a dozen camps, they face over-crowding, disease, landslides, monsoon rains and even periodic elephant attacks. Bangladeshi authorities keep the refugees closely confined to Cox’s Bazar, and are in active talks with the Myanmar government to return them to the country from which they so recently fled. Indian authorities have made no secret of the fact that these Rohingya refugees are not welcome in their country. 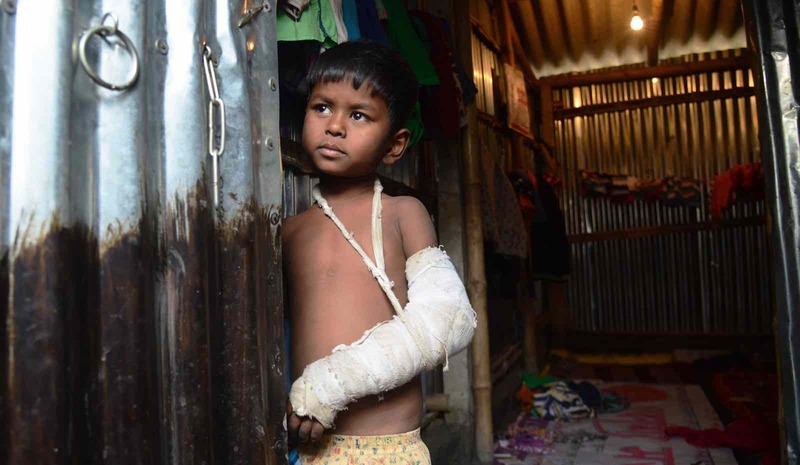 Not all of Myanmar’s most recent Rohingya refugees went to Bangladesh, however. Some sought a different sanctuary, escaping to India to join thousands of other Rohingya who fled from earlier crackdowns by the Myanmar government. Indian authorities have made no secret of the fact that these Rohingya refugees are not welcome in their country, at one stage even deploying forces armed with stun grenades and chilli gas in an attempt to prevent them from crossing the border into India. India is not a signatory to the UN’s 1951 Refugee Convention, which places sharp limits on the protections available to refugees under international law. Instead, refugees are dependent for protection on national legislation, in particular the Registration of Foreigners Act 1939, Foreigners Act 1946 and Passport Act 1967. These laws are as easily used against refugees as to defend them, however. Research by the Calcutta Research Group has found that Rohingya refugees are more likely than other groups of refugees to be targeted and arrested using such laws. A key consequence of the fact that India has not signed on to the 1951 Convention is that it is, at least in the view of the Indian government, not bound by the principle of non-refoulement. Non-refoulement obliges states not to return refugees to the countries from which they have fled. India’s government has made no secret of its desire to deport the Rohingya refugees, whether to Bangladesh or to Myanmar itself. In preparation, the government is aggressively pursuing a campaign of biometric registration of the Rohingya in order to facilitate deportation – and to prevent any refugees from slipping through the net. This biometric data is also being used to ensure no Rohingya refugees are able to register with Aadhaar, India’s national biometric registration system for residents (including non-citizens). Aadhaar enrolment is necessary for access to an increasingly wide range of services, from drivers’ licenses to bank accounts; the exclusion of Rohingya from the Aadhaar system effectively prevents them from engaging in many areas of normal life in India. Talking tough on the Rohingya is a tactic which plays well for Indian political leaders seeking to appeal to a domestic nationalist audience. Historically Rohingya refugees have faced higher levels of discrimination than other refugee groups in India, and been portrayed as risks to national security. The arrests of small numbers of Rohingya, for example in connection to drug trafficking or illegal possession of Aadhaar cards, are used to tar all Rohingya refugees with the brush of criminality. Authorities have also explicitly characterised Rohingya refugees as having potential Islamic terrorism links. Recently, controversial Bharatiya Janata Party MLA Raja Singh publicly called for Rohingya refugees to be shot dead if they do not leave India. It might be tempting to dismiss this as the rhetoric of a fringe politician looking to stir up controversy, but heated rhetoric can spark real violence. 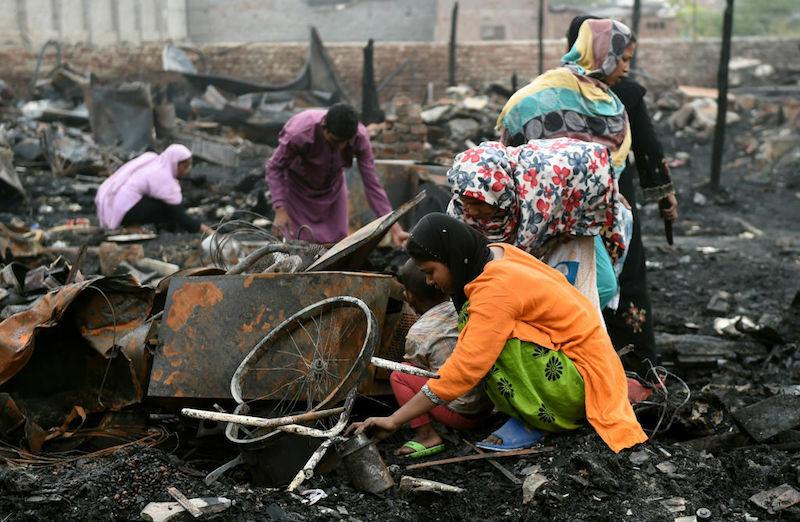 In April, a Rohingya refugee camp in Delhi was burned down. Fortunately no one was killed, but over 200 people living there lost everything, including vital documents and all of their personal belongings. This was the fourth time in six years that the camp has been set alight. A Bharatiya Janata Party youth wing leader boasted on social media about being responsible for the fire, tweeting “Yes we burnt the houses of Rohingya terrorists”, “#ROHINGYAQUITINDIA” and “yes we did and we do it again”. The Indian government continues to claim it is in discussions with Bangladeshi authorities to deport the Rohingya refugees to Bangladesh; however, the Bangladeshi government is itself in talks with the Myanmar government to return the almost a million Rohingya refugees in Cox’s Bazar, making it unclear why Bangladesh would accept thousands more Rohingya deportees from India. 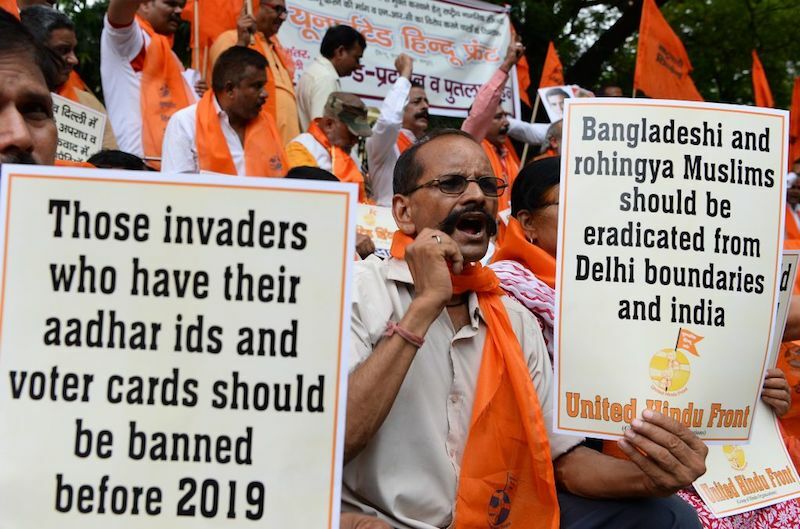 Meanwhile, the Indian government has called for Rohingya refugees to be confined to camps to prevent them from moving into other parts of India or escaping official control. The road ahead remains uncertain, but one thing is very clear: the government in India is determined to ensure that Rohingya refugees will find no lasting sanctuary there.